Then it becomes clear that it’s not the Trail that beckons me. Rather, I want to be among this great team led by Mike Armstrong. I want to be part of this adventure. We all read the great books “Endurance”, “Unbroken”, “Into Thin Air” and imagine ourselves in dire straits and wonder what we would do. Could we endure so much? Would we survive? Stumbling in line with Mike Armstrong and his two great sighted guides, Yancy Herriage and Ben Cane, as they climb up mountains and stagger down valleys only to repeat the process mile after mile, is surreal. At 11 pm, my knees are giving out. My mind wonders from my blistering feet, to the cactus in my toes and shins, to my shoulders straining under the weight of my backpack, to my brother’s feet spotlighted by my headlamp as I follow him in the single file line up and down the slippery trail pondering, “Why am I here?” But as I listen in the darkness to Mike, Yancy and Ben talk about the cold of Patagonia, the altitude of Mount Lemmon, the tea saucer-size spiders in Sabino Canyon, I realize they are experiencing an adventure only nine hikers a year dare to attempt. Only 9! Even Everest boasts 150 climbers a year. I want to go back. I want to walk with these heroes again. I will never be able to boast that I hiked the 807-mile Arizona Trail, but I will be able to taste their adventure, if only for a day. An adventure I will be able to feel far beyond the closing of a book. 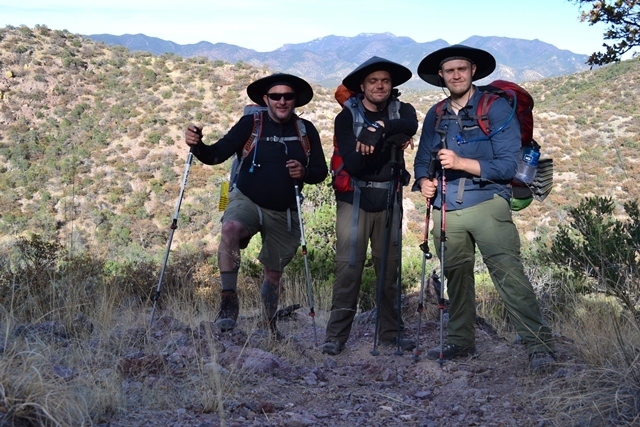 I want to be able to tell people I was there when heroes endured and Mike becomes the first blind man to hike the great Arizona Trail. Mike Armstrong © 2016. All Rights Reserved.